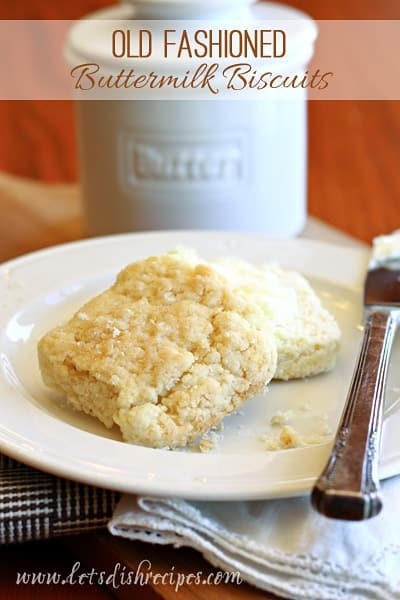 My mother-in-law shared this recipe for buttermilk biscuits soon after my husband and I were married. It was first shared by her grandmother, who was born in 1889. So it really is an old fashioned, family recipe! 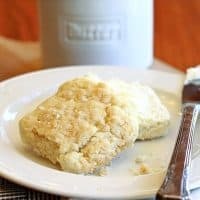 It’s a little different, in that most biscuit recipes don’t call for eggs, but I think that’s what makes these biscuits so good! For the lightest, fluffiest biscuits, mix the dough as little as possible. I do all the mixing for these biscuits by hand. Contrary to popular belief, your biscuits don’t need to be round. I usually just press out the dough and cut it into squares before baking. In a medium bowl, mix together the dry ingredients. Work in margarine with a fork or hands. Add beaten egg and stir gently. Add the milk 1/4 cup at a time, stirring gently until dry ingredients are just moistened and a soft dough is formed. Turn onto a floured surface and press out gently with hands to desired thickness. Cut and place close together in greased 9×9 pan. Bake at 350 for 15-20 minutes. Who Dished It Up First: My husband’s great-great grandmother.